You might have heard about a little event that was hosted in Minneapolis toward the end of January: the Super Bowl. While projections abound about the potential economic impact that comes to the host city during the event, one thing is clear: for at least one week, the city was highlighted in a positive light for the entire country to see. Bringing this kind of recognition to a city is a highly-coveted thing. In addition to the impact made just by hosting, cities tend to see an uptick in tourism, conference hosting, and more. And with the Final Four coming in 2019, Minneapolis hopes to net even more publicity. As more conferences look to come to the Bold North, consider using local vendors as well for your conference needs. Including custom name badges. Love it or hate it, there's one thing nearly as ubiquitous as vendors giving away USB drives at conferences: custom name badges. It's access to the conference, after events, and in some cases, can provide a schedule of events to which an attendee has easy access all the time. As conferences make their name badges a more integral part of the conference experience, it pays to invest in product that showcases not only the industry, but the region as well. Some people treat their badges as just that - badges to display in their offices of their industry ranging. Create something unique and worth keeping - a potential conversation piece. All of these things which become handy when traveling. As locals, we bring Bold North sensibilities to our products, and can ensure that your attendee swag will be useful and hardy. Sunrise Packaging should be your first contact when you start scouting out Minnesota-made products for your next event. Contact our sales team today to start! Conference organizers always try to find ways to make their events unique and memorable, but there are some things which should be standard. Attendees, particularly those who might have had to deal with unpredictable flights or transportation/hotel issues, will always appreciate a streamlined check in process. It's a process where Occam's Razor is well-applied: the simpler, the better. This definitely goes for conference materials, like the conference badge. Some conference materials are necessary evils: the plethora of paper collateral from sponsors, the (usually) hideous conference bag, and sometimes a conference tee designated to become bottom-drawer filler. Or, if you attend a lot of technology conferences like I do, it's worn daily by some of the less hygienic attendees for the conference duration. All things considered, most of these materials are expendable. It makes sense to refocus on the one thing that attendees will use and reuse: the conference badge, or name badge. Here are some tips to create a badge worth its salt. Or at least worth the irritation of remembering it daily. 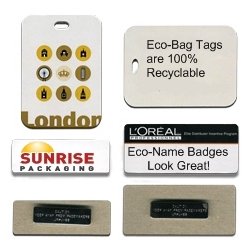 And, when the conference is over and the badge has served its purpose, Sunrise Packaging conference name badges are eco-friendly and completely biodegradable! Choosing the style of a conference name badge can depend by industry. Tech conferences, which tend to be slightly more informal, typically use lanyards with the badge hanging around the midsection. If this is the route you want to go, be considerate of the variety of shapes your attendees come in (male, female, proportions, etc). Choose a lanyard with adjustable sizes so they can choose where it should sit. If the conference is an industry which tends to be more formal, consider a simpler conference badge that's more of a traditional name tag with magnetic backing. There's little more annoying than putting holes in an expensive blouse or suit. Not to mention that it might hurt the fabric. Name tags also tend to be a little more discreet and elegant. Embedding RFID or NFC technology within the layers of a conference badge substrate. Attendees can scan their badge to win prizes, session room counts, supply contact information to enabled vendors...the possibilities are endless. For maximum readability, print information on the back of a lanyard upside down! Name tags might not serve many purposes after the conference, unless they're well-designed and not obtrusively tied to the event. Keep your conference badge design simple, and attendees will appreciate the streamlined effort. Particularly if they're already a little jet-lagged. Sunrise Packaging is more than just a box manufacturer. From start to finish, we can bring your product to life. Our unique facility, consolidated with a variety of machinery and tools from several walks of manufacturing, coupled with our mission to be the most complete fulfillment house around, makes this shop truly one-stop. We pride ourselves on planning the interior and exterior. Custom inserts and outer decor. 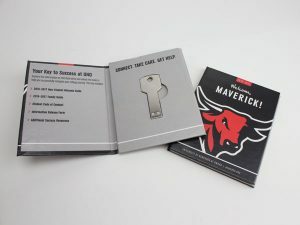 If you need personalized flash drives preloaded with data to complete your launch kit, we can do it! 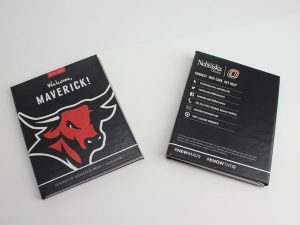 Custom mailers for shipping? No problem! But did you know we might even be able to help create your product itself? Such is the case for one Steve Diemer. If you don’t know him by his name, you probably know him by his product. 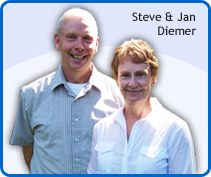 Steve is the inventor of Little Cloud Nine™ travel pillow and we were lucky enough to get to pick his brain about it. What is story behind your product? How was Sunrise Packaging able to assist in bringing the Little Cloud Nine™ to life? Wow! Thanks, Steve! That’s high praise! From the early stages of Steve’s design, Sunrise was there working with him from the initial concept. We used RF sealing to create the actual pillow. RF, or radio frequency, sealing uses high frequency electromagnetic energy to bond materials. 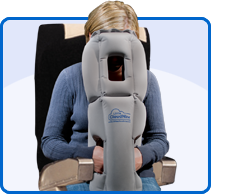 In the case of the travel pillow, it was a medical grade flocked plastic that we sourced just for his product. That’s right, we didn’t just packaging his product, we made it! Of course, in the end, we used our specialties–logo silkscreening and sbs paperboard packaging–to finish the job all under one roof! You can struggle with concept planning, you can search for mockup artists, you can bounce around from manufacturer to manufacturer trying to all the pieces in place–or you can put in a call to Sunrise Packaging. We get the job done from start to finish.